You’ve booked your small group tour in England (or Italy or France…), and now you’ve got to figure out how to get there! For travelers crossing an ocean to get to Europe, planning flights and booking tickets can be one of the most frustrating parts of the process. Air travel represents a large expenditure and involves a variety of decisions. What airline? What schedule? How long do I need for a connection? Where should I buy my ticket? If I wait, will I find a better price? Some people simply turn the process over to a travel consultant, but many of us continue to do our own research and buy our tickets online. I’m the travel planner in our family, and although I’ve booked almost 40 roundtrips to Europe over the past 20 years, I’m definitely not the ultimate expert on this topic. I asked the other US-based Slow Travel Tours members to join me in discussing our personal strategies for planning and booking our flights to and from Europe. We’ve all been traveling to Europe for many years, and most of us make several trips each year. We were interested to learn from each other and hope you’ll find some useful tips too. We’ll be back next week to discuss how to ensure a relaxing transatlantic flight. Matt Daub, Arts Sojourn – lives near Philadelphia and has made an annual trip to Europe for over 20 years. Shannon Essa, GrapeHops – lives in San Diego and travels to Europe twice a year. Jim Nilsen, Photography Travel Tours – lives in the Seattle area and travels to Europe once a year. Bill Steiner, Adventures in Italy – lives near Charlotte and makes two trips a year to Europe. Kathy Wood, European Experiences – lives in Knoxville, Tennessee and travels to Europe 2-4 times a year. Anne Woodyard, Music and Markets Tours – lives outside Washington DC and makes 6-8 annual trips to Europe. When do you normally book your flights to Europe? What’s your strategy about timing? Bill Steiner: It’s been our experience that the best fares are to be found starting at about 90 days before departure. Booking before that seems to incur a premium. Matt Daub: The airline industry is totally unpredictable these days. At one time you could count on the prime time to buy at about three months prior to travel, but all bets are off these days. My advice is to book as soon as you find a decent fare. Watch for sales and if a good price pops up grab it. Shannon Essa: I used to think that the earlier you book the better, to get the best fare, but now it seems like the fare stays fairly consistent month after month. It DOES pay to watch the fares though in case there is a sale. Usually I book a month or two before flying. Anne Woodyard: From 60-90 days prior is what we prefer, but we’ve sometimes found good fares closer to departure date. Timing is tough! 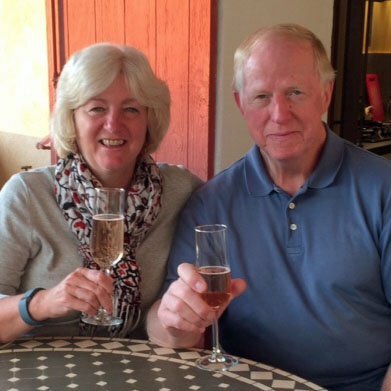 Kathy Wood: Years ago I used to book as soon as flights were available (11 months in advance). Now I wait until closer to the date and start looking seriously at fares about four months in advance. Sometimes fares go up as the date approaches! It’s definitely a gamble if you wait too long… and you might find the seats you prefer are gone too. I often spend way too much time on this and continue checking flights and prices, hoping something better will appear. I’m resolved this year to be more decisive in going ahead to make my reservations. Do you have a preferred airline for flights to Europe? Bill Steiner: We believe a direct flight with the lessened chance for delays via connections and the shorter total travel time is more important than cost. Therefore we use American with their direct flights to Rome from Charlotte, one hour from our home. Anne Woodyard: We definitely prefer United, because the extra inches of legroom really matter to tall people like us, and we live quite close to the United hub at Washington Dulles. We fly enough that we are frequently upgraded and receive other benefits, so it’s worth it to us to try to use one airline alliance, in this case Star Alliance. Matt Daub: We don’t have a preferred airline although we’ve been flying US Airways (now American) a lot lately. I’ve yet to have my faith restored in Alitalia. Too many serious issues in the past, but I’m hopeful. Kathy Wood: I think this very much depends on where you live and what flights the different airlines offer. We live in a southeastern city and our best flight options are on Delta; we fly Delta or Delta partners on all our international flights. This also helps us achieve elite status on Delta, which is pretty important to us. I’m a million-miler, and we’re always Silver Medallion and sometimes make it to Gold. We think we’ll get the best service from the airline when we’re a preferred customer, especially if there is some problem. We’d only consider another airline for an international flight if the cost was significantly lower. Shannon Essa: I don’t really have a favorite airline, but I’ll choose Lufthansa or Air France over other options. How do you find the best fares? Any strategies for saving money on air travel? Bill Steiner: We watch fares, have fare alerts, compare several sites including the airlines’ sites. All the reading I do tends to suggest there aren’t really best days or times. www.hopper.com is an interesting site that we have not explored much, but which claims to be able to find low fares. Matt Daub: I now use Google Flights, which used to be owned by ITA Matrix. They do not sell flights; they only provide information . Booking sites such as Expedia DO NOT show the cheapest flights or a complete list of flights. Anne Woodyard: I begin my search with Trip Advisor Flights and Kayak, find the timing and airline I want, and usually book through our airline of choice. Kathy Wood: I start on the Delta website, but also check Kayak to see what other fares might be possible on other airlines. I used to occasionally book through Orbitz or Travelocity, but not anymore. I’d rather book directly with the airline. A couple of years I didn’t like Delta’s price to get us to Marseille. I booked Delta flights to London, and then separately booked an inexpensive British Airways flight to Marseille. That wasn’t really convenient but saved us about $500 each. This was a good strategy in 2013 and 2014, but didn’t work in 2015. Do you use budget airlines for travel within Europe? Why or why not? Jim Nilsen: We definitely use budget airlines. They are so inexpensive and faster than trains. Shannon Essa: I often use the budget airline Vueling, based in Barcelona, because I travel in and out of Barcelona a lot and they have flights to a lot of places. I can fly nonstop from Dubrovnik to Barcelona, in between tours, on Vueling. And in September I flew to Torino nonstop from Barcelona on Vueling. They service a lot of smaller airports, which is great. Anne Woodyard: Yes, often, to get from one tour location to another. We really dislike paying for everything (which we don’t do on the major airlines we fly since we have status with Star Alliance) and waiting forever in long lines, and the extreme lack of space for both us and our bags. But sometimes it’s really the best way to get from one place in Europe to another. Bill Steiner: Generally no. We compare prices and if really better we will use them. We find the uncertainties of final cost and the hassles associated with it not worth it for us. Kathy Wood: We’ve flown the budget airlines just a few times (mainly EasyJet and Ryanair once), when they truly offered the best itinerary and price. I do get very nervous about the strict weight limits though… I’ve flown in my hiking boots a few times. And if something goes wrong with your flight, you have very little back-up for another flight. I would rather fly a major carrier. Matt Daub: Budget airlines are unnecessary for our needs and too much hassle. Booking through one company and its partners provides some protection for missed flights and other issues. What are your favorite cities in America or Europe for making connections? Why? Bill Steiner: We avoid any New York airport and Charles De Gaulle in Paris. We’ve had problems at both of these airports in the past. Matt Daub: Newark and JFK have been our major airports. Philadelphia has now improved to the point that it makes the most sense for us getting to the airport and parking. JFK offers the best prices though. You must always figure in the cost and time getting to and from an airport when considering price. Shannon Essa: I’m not the biggest fan of making connections through ANY airport to be honest! 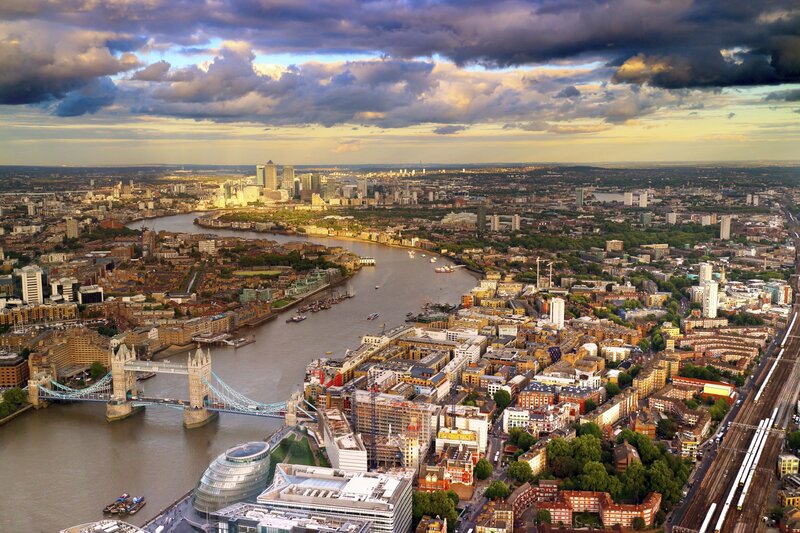 I like to go through Heathrow – but I like to stop in London for a couple of days first! Anne Woodyard: Our usual connecting cities are Brussels, Munich and Frankfurt, since those are the ones United uses. Frankfurt is our least favorite because of the size of the terminal; it takes a long time to get from one gate to another. We like to connect through Amsterdam if possible and allow ourselves time enough to get into the city, which we love. We also enjoy a few hours in Brussels on a layover. Both cities are extremely easy and quick to get to and from the airport. 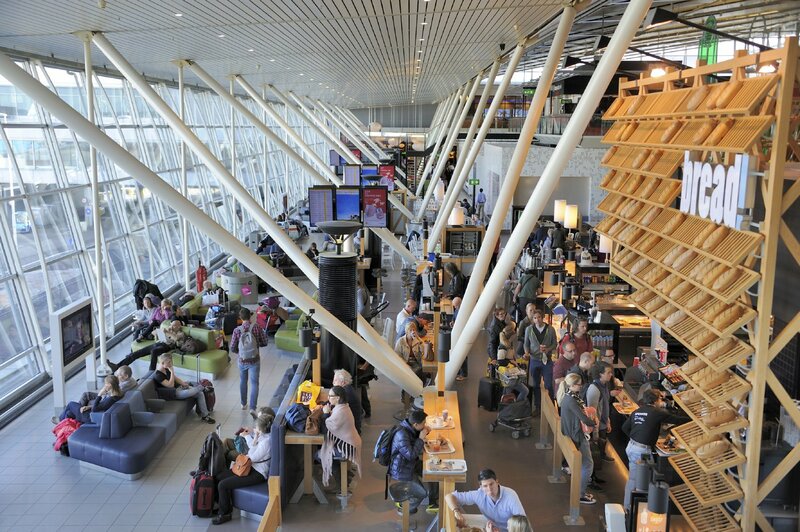 Jim Nilsen: We like making connections through Amsterdam, as we think it’s a better airport than Charles de Gaulle. London can be hampered by fog. Kathy Wood: In the USA we prefer connecting through Detroit over Atlanta. There are more options through Atlanta (to and from Europe and also our Knoxville airport) but it seems there are more delays in Atlanta. In Europe we really like connecting through Amsterdam, though I’d be more cautious about a winter flight and possible weather issues. Amsterdam is a great airport… good places to rest and great shopping and eating places… even a museum! 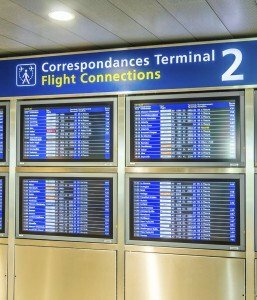 Any other tips for planning your itinerary for international air travel? Bill Steiner: In fifteen years of travel we have had very few delays. 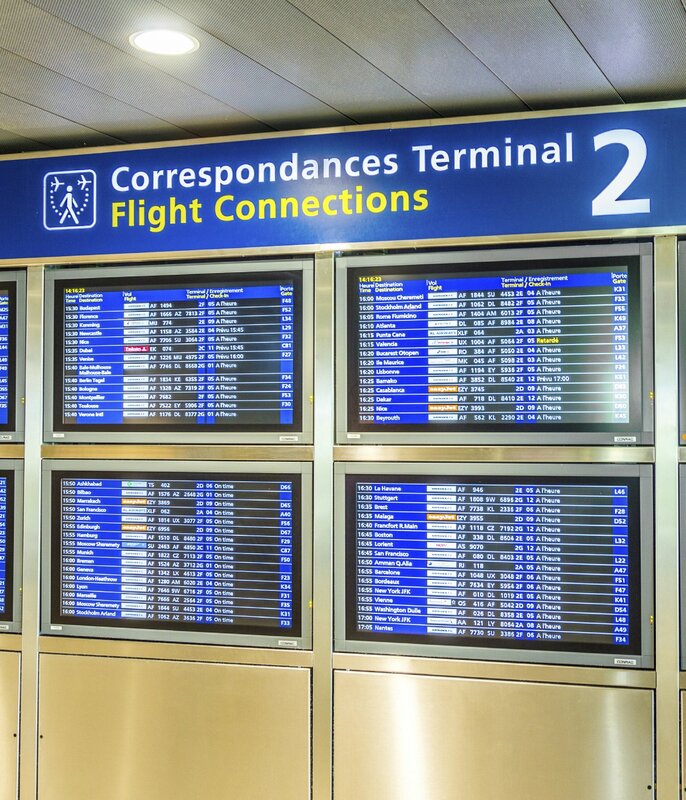 The one strategy we employ is to allow lots of time when we connect, often opting for a later connecting flight to ensure that any problems on the first flight, distance between gates, or issues with customs does not prevent us from making the connection. We recommend at least two hours for connections. Matt Daub: Mid-week is far better than weekends for price. Tuesday thru Thursday seem to offer good options. Shannon Essa: To avoid long travel days from the west coast, I’ve been flying San Diego to London nonstop on British Airways, spending a couple of nights in London, then continuing to my destination. I usually get a free room using miles, and do a lot of walking around to shake my jet lag. But I know you have to have a bit of extra time to make this work. I try to avoid connecting in airports that could have bad weather (like Chicago or JFK), go straight from the west coast to Europe, then change planes. I also avoid low-cost airlines that only fly to a destination twice a week; if something goes wrong, you are kind of stuck. Last year I had a flight on Lufthansa coming home from Barcelona through Germany, and I was not going to make the connection in Germany due to late incoming aircraft. Lufthansa put me on a British Airways flight home. I don’t think a low cost carrier would have done that. Jim Nilsen: I find it is better to spend more money on flights with the fewest stops and shortest layovers. I am more rested when I get to my destination. Also, be sure to pay attention to the layover time between connecting flights. If it is too short (1.25 hours for example), you run the risk of missing your connecting flight. We had to spend the night near the Amsterdam airport one time because of this. Kathy Wood: I definitely agree about allowing enough time for connections. I would never connect in Paris with less than an hour and a half unless there are many regular flights to your next destination. If you have to connect through a US airport, don’t EVER book the last flight of the day to either the US airport or your European destination. I’d much rather spend a few hours in Detroit or Atlanta on a layover than miss my overnight flight to Europe and have to spend the night there and miss a whole day of my European trip. This happened to us twice early on, and never again!! How important are frequent flyer miles to you? Why? Bill Steiner: We appreciate the ability for free tickets that we get from our frequent flier miles. But it is the perks of early boarding, free bags, better seats, and the oh-so-rare upgrade that are most important to us. Matt Daub: I’ve had terrible experience with frequent flyer miles. I lost almost 200k through American years ago, and the airlines constantly drop or misplace them. I don’t really care anymore. Convenience and price are my motivators. Shannon Essa: I tell people – NEVER fly without signing up for the frequent flyer program on your airline. Even if you just fly a few times a year, you can keep your points active in other ways so they do not expire – magazine subscriptions, for instance. Certain credit cards, like the Capital One card, are also excellent ways to get free flights and their points can be used on any airline. I am flying first class to Washington DC this month using 50,000 miles that I got for free by signing up with Barclaycard and spending $2000 in the first three months. The perks are out there… you just have to find them, and utilize them. Anne Woodyard: The miles are quite important, but the status is more important since it means we don’t pay to check luggage, we go through a fast security lane, and a fast check in lane, and are often upgraded. When you fly as much as we do, that really matters. Jim Nilsen: The miles aren’t too important to me, as I don’t fly that much… only one round trip to Europe each year. What is important to me are the points on my Capital One credit card. I can use the points to redeem money spent on airfare on any airline. Plus there aren’t any foreign transaction fees when using the card in Europe. Kathy Wood: The miles and the elite status are important to us. Over the years we’ve had lots of free flights, which we now primarily use for domestic travel and for our daughter’s travel. Like Shannon and Jim, we earn points on our Capital One card, and we also earn points on our American Express cards… we can use these for flights that earn us airline frequent flyer miles. I make most of my online purchases through a Delta shopping portal to earn even more points. We used to get upgraded in the past, but that doesn’t happen much nowadays. We do like being able to board early to ensure room for our carryon luggage and also the free bags and ability to choose preferred seats. Thanks to our Slow Travel Tours panel for sharing their experiences and ideas. If you have other suggestions, we hope you’ll leave a comment! In next week’s blog we’ll discuss our tips for ensuring a relaxing flight to and from Europe. Interesting to see everyone’s take on this. Ultimately, being flexible and rolling with any issues makes sense. We always get there!